So you are thinking about visiting Tulum . . . Great! Tulum makes a great diversion from either Cancun or Playa del Carmen. It is a must see in the region, so if you are staying near, visit here. 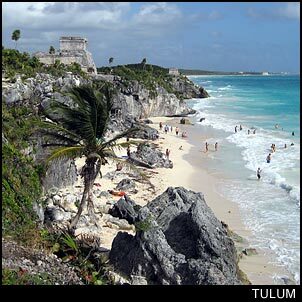 Though most people that come to Tulum are from one of the larger destinations just to the North . . . Tulum makes a nice little get away in its own right. Though the city of Tulum is quite small, there is shopping to be had just a quick 45 min shuttle ride up the coast to Playa del Carmen . . . the beach is lined with accommodations for any budget from campgrounds to cabanas and high end retreats . . . and there are some great sights to see in the area. Lets start with the Tulum ruins. The location which overlooks the turquoise blue Caribbean and sports its own little beach head makes the Tulum ruins the most picturesque in Mexico. Then there are the Coba ruins which make a great day trip that allows for plenty of time walking under the shade of the jungle canopy while strolling from one section to the next. Busses and tours leave from Tulum for day trips to Chichen Itza every morning. It only takes a couple of hours to get there and is definitely worth the time. By the way . . . if you plan on picking up some souvenirs while in Mexico, getting them from the artisans who make and sell their wares in Chichen Itza will allow you to buy twice as much (or something twice as good) with the same amount you would spend for them in Tulum. Then there are the white sand beaches, crystal clear Caribbean waters, and every water sport imaginable from kite surfing to scuba diving. If you do it in the water, you will find someone doing it in Tulum. If you are driving to Tulum, there is an intersection where you can either head for the beach, or head into the town of Tulum. The highway that runs through the town really is the main strip. Back streets do have some accommodations, but most of it is made up of residential neighborhoods where the locals live. If you are heading for the beach, the road will split going both north and south to access the ruins or accommodations which line the beach. Before deciding how many days to spend in Tulum, you will need to decide if (and how long) you want to spend visiting Cancun, Playa del Carmen, Chichen Itza, Cozumel, or Isla Mujeres. (Information on side trips to the Coba ruins, Xel-Ha, Xpu-Ha, and Xcaret can be found on our Cancun Tours page).